When mouse moms ate a high-fat, high-calorie diet while nursing, their offspring developed obesity, early puberty, diabetes and fertility issues. 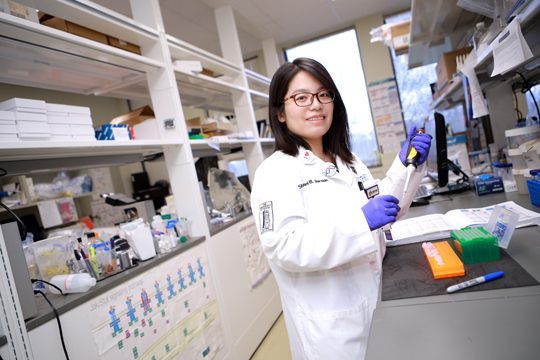 Dr. Mengjie Wang, a PhD candidate in the Department of Physiology and Pharmacology, is the lead researcher of a team that used mice as a model to study the impact of excess calories during the breastfeeding stage on the offspring’s metabolism and reproduction. To determine how excess body fat alters the timing of puberty, Wang’s team gave female mice that are new mothers a high-fat diet from the date they gave birth and started breastfeeding until they weaned their offspring. A second group of mice that also were new mothers were given a regular diet. The onset of puberty was evaluated in the offspring after weaning, and fertility tests were done on the mice in adulthood, as well as an examination of their metabolic function. The study found that offspring of the mothers fed a high-fat diet while breastfeeding suffered from glucose intolerance and insulin insensitivity. They also had decreased litter sizes and impaired pregnancy rates. Wang said the research is significant in the clinical setting because doctors don’t always follow the same patients from puberty to adult life. “Our findings can alert doctors and patients with early puberty that other health problems may arise after they become adults,” Wang said. This entry was posted on Friday, July 6th, 2018 at 3:44 am and is filed under Medicine and Life Sciences, News, Research, UToday .